Yolo Move-On is a natural partner for Cool Davis. Their mission statement describes them as an active, local subset of the larger community of more than 8 million Americans from all walks of life who use the connective power of the internet and personal political activism to lead, participate in, and win campaigns for progressive change. Where Cool Davis is committed to encouraging people, businesses and organizations to examine and reduce their carbon footprints, Yolo Move-On is committed to keeping a sharp eye on the political landscape and responding by showing up in person or in writing to advocate for the leadership and legislation that will turn our course away from climate change and toward a sustainable future. We need both approaches even as we move forward to implement the recent Paris Accord. 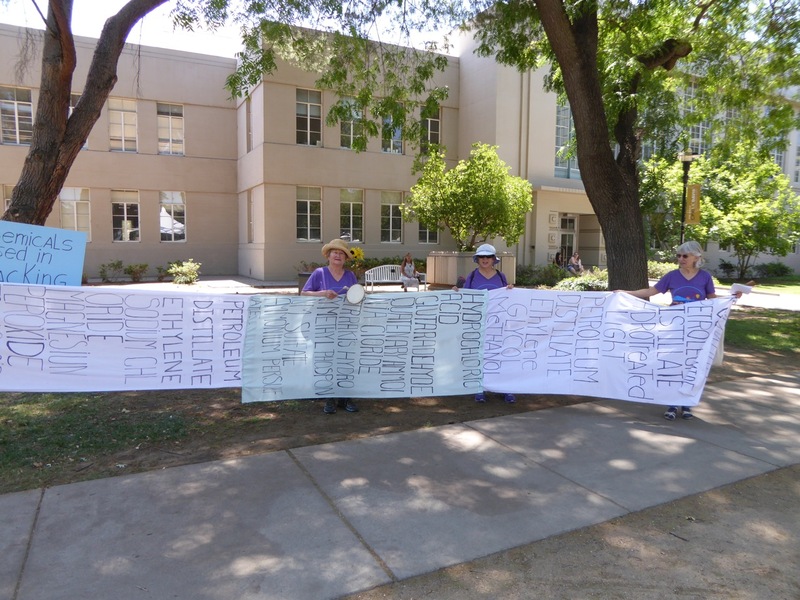 The lively members of Yolo Move-On know how to show up when a physical presence counts. ..Yolo Move-on members show up in writing, too. Most members have written multiple letters on the DEIR and RDEIR documents for the proposed oil train rail spurs in Benicia and San Luis Obispo that could potentially bring two 100-car trains of crude oil through Davis each day. Watch the letters to the editor and op eds for frequent commentary as Move-On activists work to alert readers to critical issues. Both Carol and Elizabeth consider education to be a part of their mission. “We’re looking to have some fun this spring by participating in the Picnic Day Parade with some progressive topics highlighted as we march by,” smiled Carol when asked about coming events. 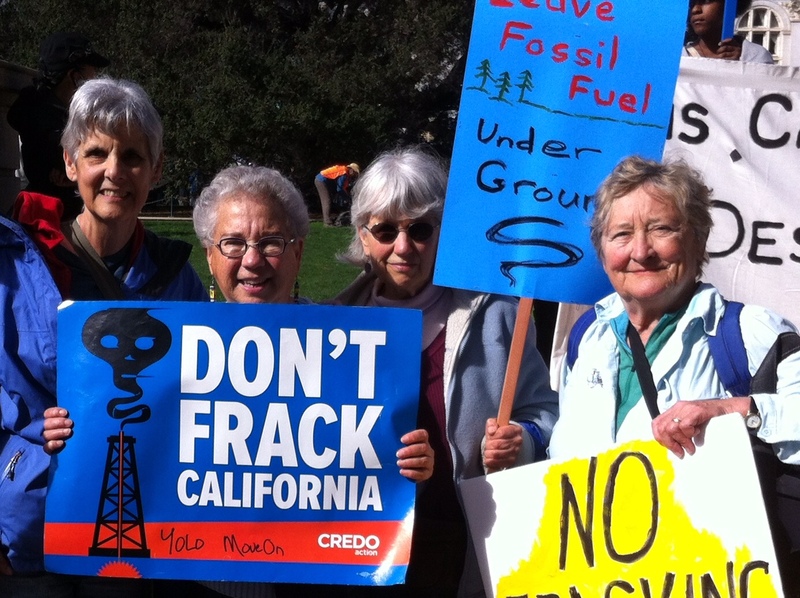 Yolo Move-On members paraded through Picnic Day 2015 with long lists of fracking chemicals. Yolo County is lucky these spunky Move-On folks keeping us all on our toes. 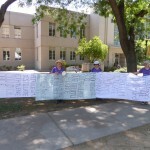 Elizabeth Lasensky is an activist from the Bay Area, and Carol Warren came from West Virginia where she worked on tough topics like mountain top removal. Elizabeth and Carol are the 2015/16 co-chairs of the group. Other members include Jean Jackman, a long-time Davis activist, Frances Burke, a Capay farmer turned activist/artist, Nancy Schrott, Reeda Palmer, and others. With their leadership and constant vigilance regarding key issues, the rest of us can jump in and join them on any number of critical matters that call for our letters, our signatures, our presence, our donations, our votes. Cool Davis welcomes Yolo Move-On and the important way they work to move us all toward a more livable future.